Hello everyone: It's amazing how time flies, don't you think? Just a few months ago, we were still shoveling snow from our driveway and bundling up to go anywhere and now, we are in the middle of the year, enjoying warm temperatures, trips to the beach and water parks, cooking out, etc. But my teammates and over at SHOPPING OUR STASH want you to think Christmas thoughts and join us in the gallery with your "Christmas in July" creations. Here is my card, I went out of my usual style and used only dies to create it, hope you like it. Thes cookie die cuts are done with a Papertrey Ink die set called SWEET HOLIDAY WISHES, it has a coordinating stamp set but sometimes, getting the dies is all you need. The cookies are cut with the dies and I just added little dots with a white gel pen to decorate them a bit. 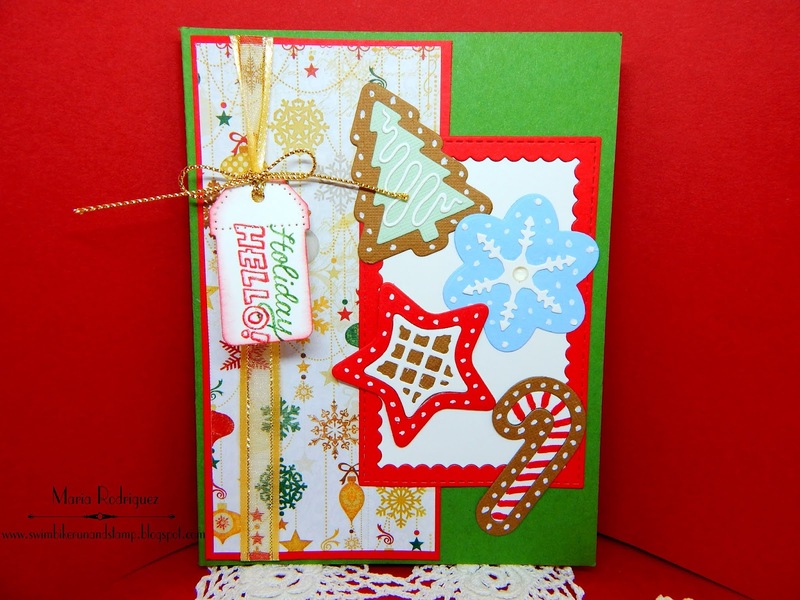 The pattern paper is from an old Holiday pad and the ribbon from my stash of bits and pieces. The sentiment is from a little box of left over sentiments, it was just the perfect size for my card. 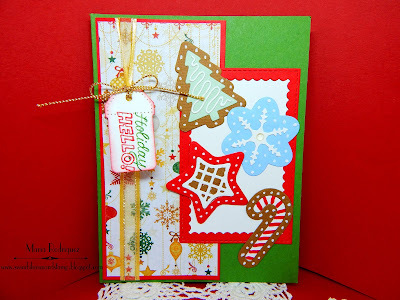 The lacy border is from a retired SU set called "Bordering Details", the sentiment is from a retired Flourishes set called "Sweets of the Season" and the yummy cookie from my Papertrey Ink die set. 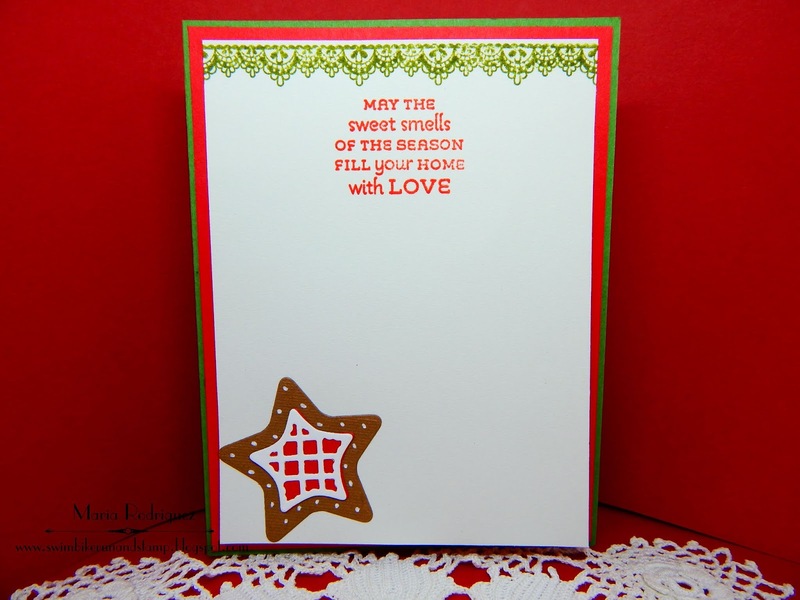 I hope you can come and play along with us at SHOPPING OUR STASH, please stop by the blog and click on my teammates' cards to see how they made them. It won't be long and we'll have to get real serious about Christmas cards. This is adorable with all the cookie dies! Perfect sentiment inside, too. What fun! i love everything about this, missus... except: i think you just totally made me crave xmas cookies!!! Such darling holiday elements, inside and out! Happy Christmas in July! Really cute and colorful. A precious Christmas card for just about anyone ! !